Our IDX and Lead Capture widgets help transform your website into a modern, information-rich and customer-friendly showcase resource to help you capture leads and engage your clients. IDX Widgets are modular, customizable components that can be added to any part of your webpage. There’s no IFRAME or subdomain – so you can design pages and page-layout the way YOU want! Pages or blog posts can have multiple widgets. Everything fits with YOUR design! 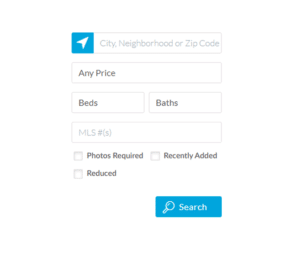 Search forms incorporate ALL the “general” and “local” fields of YOUR MLS! The standard search form for your MLS will allow searching by all MLS fields and criteria. Use the customer Search Link Creator wizard to generate links you can share anywhere to show specific properties. WIth basic HTML skills you can create your own custom search forms! Add search forms to any number of pages. It is possible to ‘pre-select’ values where you want to guide consumers in their search. as a “list”, “grid” or “interactive map”. This widget can also be used for general property display on any additional pages on your website. Display Widgets are designed to showcase any listings based on any MLS criteria. Our Widget and Shortcode Creator Wizard helps you to generate the code needed! The List WIdget shows a list of properties according to your specifications. The Grid / Gallery widget can be shown in any number of columns AND as an animated carousel too. Apply any criteria to show properties on the interactive IDX Map Widget – including a polygon shape too if you wish! Soft Lead Capture is built-in to all widgets. Forced registration and “reminder” prompts can be applied to restrict the number of searches and properties viewed. After any search, the consumer is helped to save their search and create as many property alerts as they wish. Its quick and easy for your leads and prospects to save properties with notes. Multiple lead capture mechanisms all generate leads that go straight to your account with the integrated Leads and Contacts CRM. Making it easy for your leads and clients to sign-up and sign-in again. The My Account dashboard is their Home Search starting point. A password protected My Account dashboard allows your leads and clients to save listings, save searches and manage their own property alerts. All their recent searches and all their alerts will be shown and available for use. Your clients and prospects can track all the properties they like – and keep notes too. All lead activity in your website is tracked and integrated to your Real Estate CRM account – it’s all included!